CUPE Manitoba in the Community. Today CUPE donated hundreds of toys to kids currently in the care of Winnipeg Child and Family Services. The annual donation is a joint effort between the CUPE Manitoba Young Members Committee and CUPE 2153 which represents Winnipeg Child & Family Services workers. 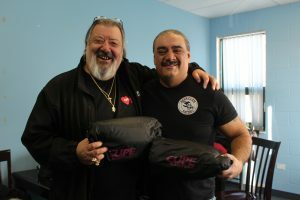 Today CUPE Manitoba presented the Winnipeg Bear Clan Patrol a gift of 100 blankets for the community. 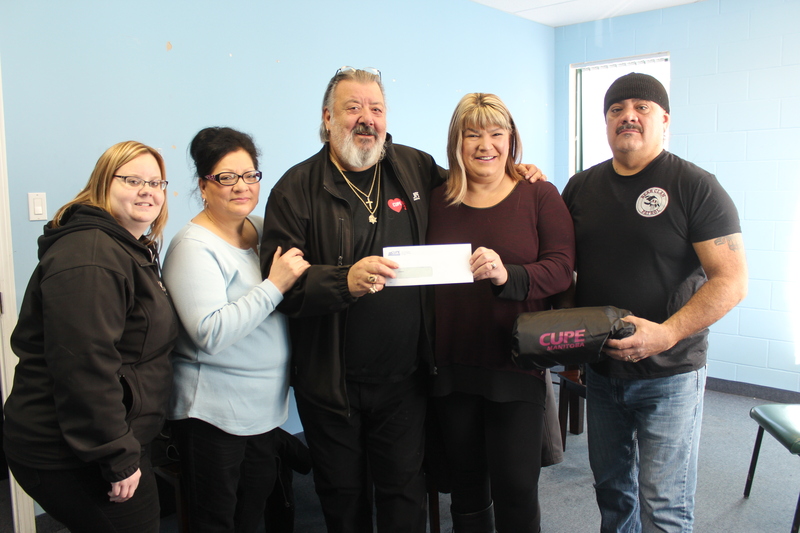 CUPE Manitoba also presented a financial contribution to the Coalition for Families of Missing and Murdered Women in Manitoba’s 6th annual Christmas Party for MMIWG Families. The Bear Clan Patrol was established in December 2014 as a grassroots response to the expressed needs of the community in Winnipeg’s North End and other communities for a safer, more secure environment. “By providing a donation of blankets we want to show that we support the important work of the Bear Clan Patrol,” says Terry Egan. “The work the patrol does is invaluable to the community, and we hope all CUPE members will offer their support either through donations, or as volunteers”. The 6th Annual Christmas Party for Manitoba Missing and Murdered Indigenous Women and Girls hosts over 200 family members, including 100 children who receive gifts and support. The event takes place on Friday, December 22 2017 at 6:00pm at the Clarion Hotel. “These families have been through a lot, and we hope that our donation will make this event a success,” said Egan. Receiving the gifts on behalf of the Bear Clan Patrol was James Favel, and receiving the gift on behalf of the Coalition for Families of Missing and Murdered Women in Manitoba was Bernadette Smith. 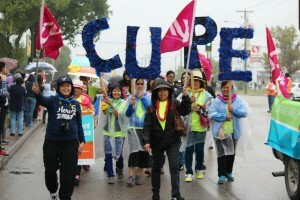 CUPE members were out en-force on July 6, protesting the Manitoba government’s cuts to health care. 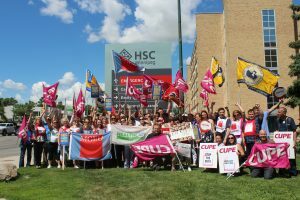 “Employees at Health Sciences Centre (HSC) and CancerCare Manitoba are overworked, understaffed, and deeply concerned with the Pallister government’s massive changes to health care” said CUPE Local 1550, representing support staff at HSC and CancerCare Manitoba. 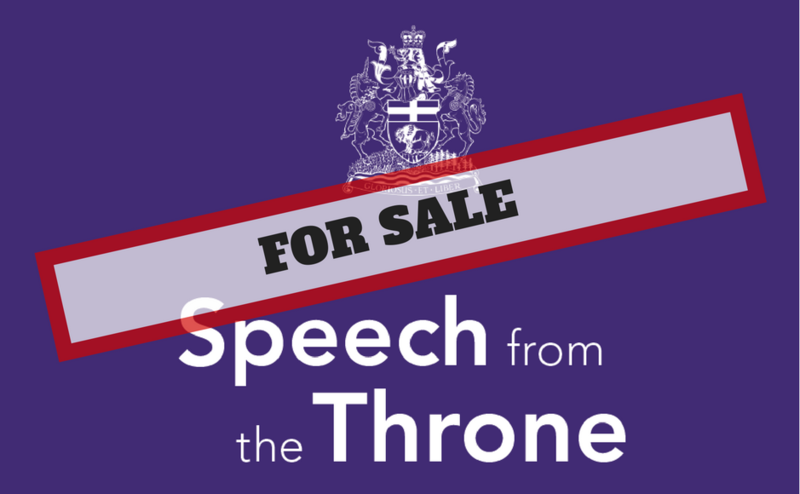 With Emergency Rooms and Urgent Care Centres closed, new long-term care facilities canceled, the cancellation of the new CancerCare building, and other hospital programs being cut and shuffled around, a bigger burden will be placed on HSC with no sign of new resources. Pickets were held from 7:15am – 9am, 11am – 1pm, and 3pm – 5pm throughout the day to facilitated shift changes so members could join the picket line. Local media noted the significant support from members of the community driving by. Recent polling found that the majority of Manitobans are opposed to the governments closure of Emergency Rooms and Urgent Care Centres. 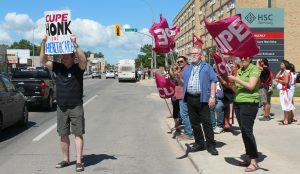 CUPE and other unions have held numerous rallies against cuts, including outside the Concordia Hospital, Seven Oaks General Hospital, Victoria Hospital, Misericordia Hospital, at the Manitoba Legislature, and in Flin Flon. “Our pickets today are to keep the pressure on the government by continuing to raise awareness against the cuts”, said CUPE 1550. CUPE members from Locals 500, 998, 1599, 1973, and 2348 came out in support! CUPE members were also joined by dozens of activists from sister unions, including Amalgamated Transit Union 1505, Canadian Postal Workers, Manitoba Association of Health Care Professionals, Manitoba Federation of Labour, Manitoba Government & General Employees Union, Manitoba Nurses Union, Public Service Alliance of Canada, Unifor, and Workers United. 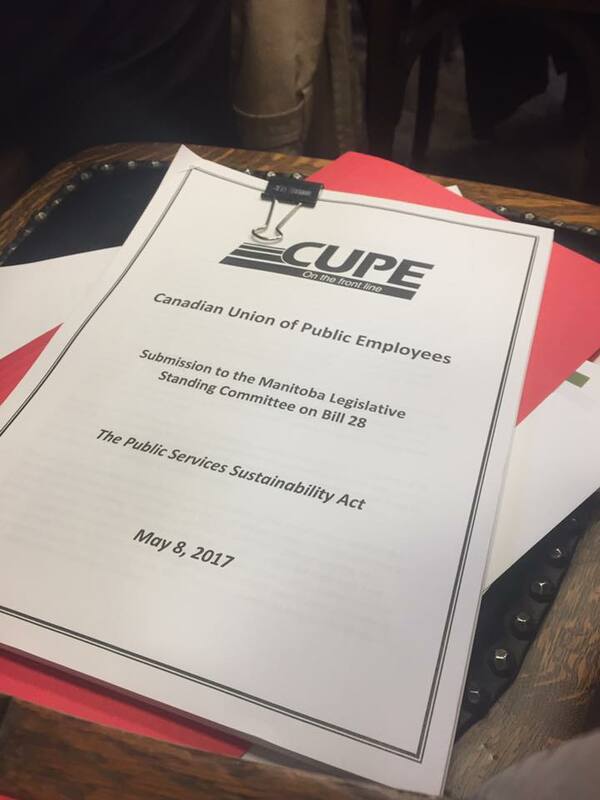 It is with great dismay that CUPE has learned of the closing of the Tolko Industries paper and saw mill in The Pas, Manitoba, resulting in the loss of over 250 jobs. While CUPE does not represent Tolko workers, we do understand the impact the closure of this plant will have on the community at large, and on individual families. We echo the concerns of Unifor Locals 1403 and 302, which represents mill and office workers, as well as supervisors at Tolko Industries in The Pas. “Our members who have loved ones working at Tolko will be hurt by this closure,” says Kelly Moist, President of CUPE Manitoba representing public sector workers in health care, education, and municipalities in The Pas and RM of Kelsey. “For every good job lost in Manitoba’s North, there will be serious economic and social implications for the community as a whole, as well as on individual families”. The recent news of the closure of the Port of Churchill further exacerbates the employment and economic crisis that is unfolding in Manitoba’s Northern communities. Due to this closure, the Pas and RM of Kelsey will likely lose significant tax revenue generated by Tolko Industries that helps fund municipal services in the community. CUPE Manitoba calls on the federal and provincial governments to act quickly to ensure good, stable jobs are available in Manitoba’s Northern communities, and to protect those workers and families facing impending layoffs. 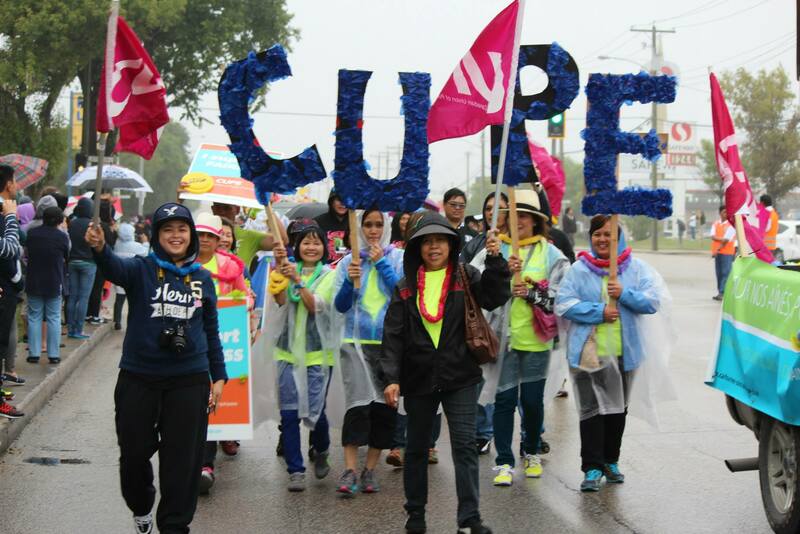 Once again CUPE Manitoba will be participating in the Manitoba Filipino Street Festival! 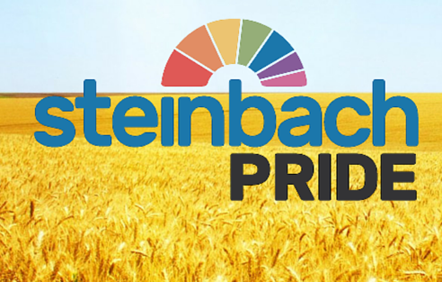 We will be marching in the parade, and we’ll also have a booth on-site during the festival. We’ll be meeting at 7:45 am to get our parade float ready, and the march starts at 9am! Feel free to join us! Thanks to all the Locals who have helped put this event together!